Asphalt shingles are the most popular type of residential roofing material today and provide one of the most cost effective solutions for your roofing needs. 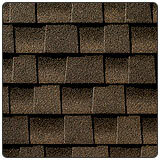 There are two types of asphalt shingles; organic and glass fiber. All asphalt shingles are coated with a layer of mineral granules that protect the shingle from sunlight, add color and, in some cases, help resist algae and fungus growth. Manufacturers can discourage unwanted plant life by adding copper or zinc to the granule mix. There are many styles of asphalt shingles to choose from and we will assist you in selecting the appropriate style and color that is best for you, after all, a home's roof compromises 30%-40% of its curb appeal. You'll hear asphalt and composition shingles referred to as "three-tab", because they come in a strip with notches that create what appears to be three separate shingles. 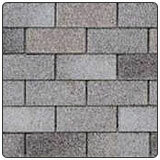 Premium Composition/Asphalt Shingle products are called "architectural" or "dimensional" shingles. These thicker, often laminated shingles cast shadow lines like a thick wood shake. Above All Roofing works with the top manufacturers to give you the greatest selection of Asphalt shingles and we will help you sort through your options based on your preferences and budget. For a free estimate, click here or call us today at 203-336-4667, 203-426-0646 or 203-660-ROOF.